In order to get the most out of your cloud computing solution, it’s important to have the right hardware and infrastructure in place. In this chapter we’ll talk about what equipment you need on your end and how it should be configured for the best interaction with your cloud. Ultimately, the clients on your end users’ desks are how you will interact with the cloud. In this section we’ll talk about the different types of clients and how they can be configured to communicate with the cloud. We’ll also talk about some security measures and how you can keep your data safe on the cloud. There are different types of clients that can link to the cloud, and each one offers a different way for you to interact with your data and applications. Depending on your organization and its needs, you may find yourself using any combination of these devices. How you interact with your data based on these clients will be a combination of factors—what your needs are, and the benefits and limitations of these client types. Security is the number one issue when it comes to cloud computing, and that only makes sense. Since a third party stores your data, you don’t know what’s going on with it. It’s easy to worry about the security risks of a cloud solution, but let’s not overlook the inherent security benefits, as well. We’ve talked about accessing the cloud via the Internet, and that is the case, in a general sort of way. 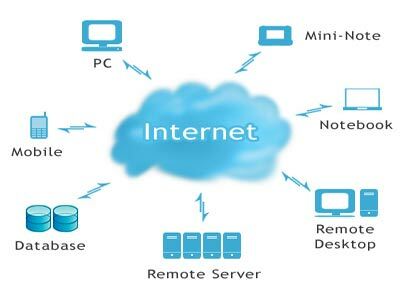 In order for the cloud to deliver its best resources, there are differing levels of connectivity needed. There are different services you will need to run, depending on your cloud provider and what your organization does. Also, these services will likely affect how your cloud infrastructure is deployed.